Illustrates the Wabash and Erie Canal - the longest fabricated structure in the United States. 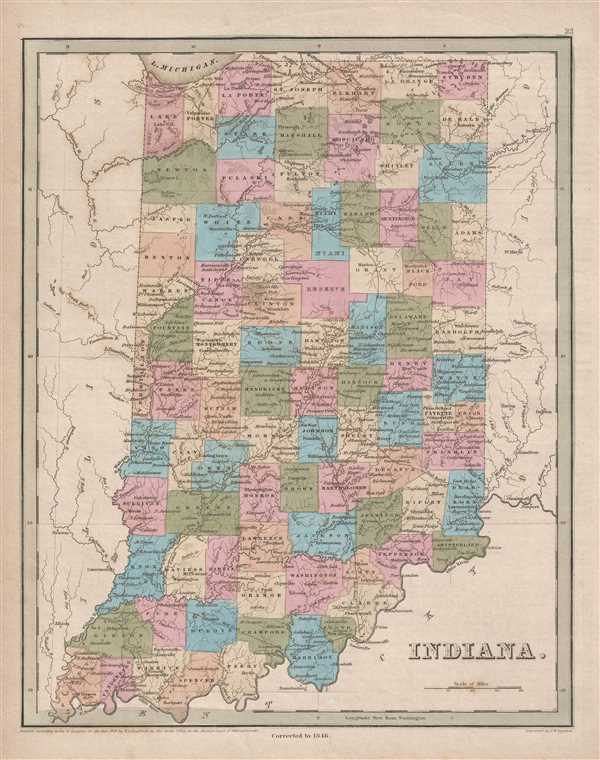 This is an 1846 Thomas G. Bradford map of Indiana. The map depicts the region from Illinois to Ohio and from Michigan and Lake Michigan to Kentucky. Highly detailed, each county is labeled and shaded a different color for easy differentiation. Numerous cities and towns are labeled, including Evansville, South Bend, Peru, Fort Wayne, and Indianapolis. Several railroads are illustrated, along with an extensive canal system, including the Wabash and Erie Canal. Extending from the banks of Lake Erie and Toledo, Ohio over 468 miles to Evansville, Indiana, on the Ohio River, the Wabash and Erie Canal was the longest fabricated structure in the United States and became part of the second-longest canal in the world. Construction of the Wabash and Erie Canal on February 22, 1832, with its grand opening celebrated on July 4, 1843. Due to Indiana's unique topography, engineering innovations were required to successfully complete the project, including swing bridges, systems of counterweights, tumbles, damns, locks, and the development of a concrete that would harden beneath water. A dam was built between 1838 and 1841along the Wabash River in Carrol County. A few local citizen blamed the dam for flooding in the area, took care of the 'problem' themselves by dynamiting the dam on February 9, 1881, destroying the canal boat river crossing, and ending Pittsburg, Indiana's economic boom. The Canal provided an economic boom all along its route, with taverns and other establishments springing up along its banks. Several other canals are also illustrated, including the incredible Indiana Central Canal, which was intended to connect the Wabash and Erie Canal to the Ohio River. Due to the Panic of 1837, however, the state of Indiana suffered financially and had to turn over the canal to its creditors, who stopped construction in 1839.